Get the fun POPPING with a fun, festive popcorn machine rental for your next birthday party or event! This classic freestanding popcorn popper and cart comes complete with everything you and your guests need to enjoy fresh, hot, tasty popcorn for hours. From the minute your popcorn party rental flips on, you’ll enjoy the delicious aroma, and guests will no doubt clamor to grab a bag. Popcorn is one of the most versatile party treats, so integrating a popcorn machine rental ensures there’s something for everyone at your event. In between games, activities or, even, a go in party bounce house, kids can grab a bag and get back to the fun—and adults can customize their popcorn however they want! Whether they slather their bag of popcorn in butter, and salt, spice it up with cayenne and red pepper, or top even a dash of truffle oil, or choose to snack on healthy, wholesome popcorn without all the extras, guests will have a blast customizing their oversized bags of fresh, savory popcorn. Each popcorn machine rental package comes with enough popcorn bags to feed your hungry crowd, plus popcorn kernels and oil—choose from coconut or sunflower—to get your machine popping! Add on a dedicated attendant to pop and serve popcorn to your guests, or offer popcorn “self-serve” so guests can grab their own bag when the munchies strike. 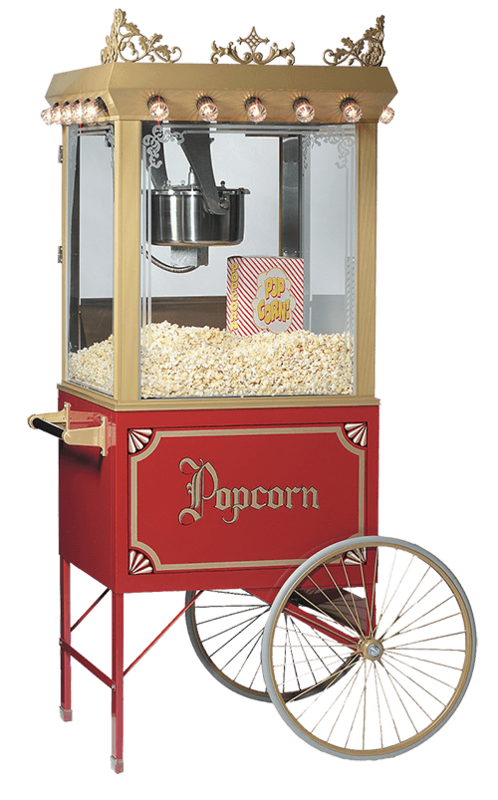 Popcorn machine party rentals are available across our entire New York service area, including Long Island, Brooklyn, Manhattan, Queens, Bronx, Staten Island and Westchester. Call now to book your popcorn machine rental, and get ready for the best party yet!